originals, like the former's "Ode to a Green Frisbee". Rudd’s recent releases include Rudd’s MALIcool, recorded in Bamako with Malian musicians, his reuniting with the New York Art Quartet (DIW), Steve Lacy (MONK'S DREAM,Verve), Archie Shepp (LIVE IN NEW YORK, Verne) and his acclaimed solo album BROAD STROKES (Knit Media). 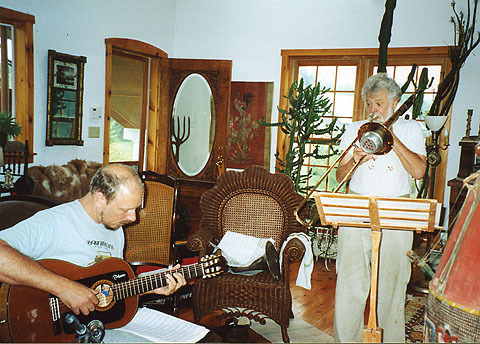 The Charlie Kohlhase Quintet with Roswell Rudd playing The Music of Roswell Rudd (Nada) was voted one of the ten best of 2001 by the Boston Globe. repertoire from renaissance through to modern music. records of 1997 in Cadence and Coda magazines. one the greats of the free jazz era.